An important thinker is one whose ideas at once address the human condition and the social problems of a particular historical moment with wisdom that echoes through time to speak to the human condition and the problems of another time. Martin Luther King Jr. was such a thinker. 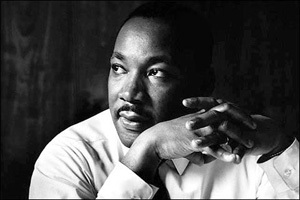 In 1963: The Broadway musical "Camelot" closes; George Wallace is sworn in as governor of Alabama saying "segregation now, segregation tomorrow, segregation forever"; the United States and other countries test nuclear weapons; Pope John XXIII writes the encyclical "On Peace, in Truth, Justice, Charity and Liberty"; police in Birmingham, Alabama use dogs and cattle prods on peaceful demonstrators; Martin Luther King Jr. writes the "Letter From a Birmingham Jail"; the Organization of African Unity comes into being; Jomo Kenyatta is elected the first prime minister of Kenya; Pope John XXIII dies; a state of siege is proclaimed in Iran and Ayatollah Khomeini is arrested; Governor Wallace stands in the school house door to maintain segregation; President John F. Kennedy gives a speech on civil rights and says segregation is morally wrong; Medgar Evers is assassinated; Paul VI becomes pope; JFK visits West Berlin and says: "Ich bin ein Berliner"; Beatle mania begins; martial law is declared in South Vietnam; 200,000 people march on Washington and King gives the "I Have a Dream" speech; network news goes from 15 to 30 minutes; a bomb explodes in the basement of the 16th Street Baptist Church in Birmingham, killing four little girls; Nigeria becomes a republic within the British Commonwealth; South Africa begins the trial of Nelson Mandela and eight others for conspiracy ; Bell Telephone introduces touch-tone phones; John Kennedy is assassinated; and Kenya declares its independence. In a world of nuclear tests, cold war, dying colonialism, global demands for freedom and self-determination, racial segregation, economic disparity peaceful protest, murderous reactions and assassinations, Martin Luther King articulated a logic of peace and a utopian democratic vision. He advanced principles that spoke to his time then, and speak to our time today. In his "Letter from a Birmingham Jail," King writes about a network of mutuality that weaves us all into "a single garment of destiny." He writes about the distinction between just and unjust laws and about the distinction between a negative and a positive peace. He writes that time is neutral and that "the time is always ripe to do right." He decries church as a social club that conforms to an unjust status quo, and writes of an inner spiritual church, "the true ekklesia and the hope of the world." He writes of the ordinary people who embody the struggle for justice and whose efforts "bring our nation back to those great wells of democracy which were dug deep by the founding fathers in their formulation of the Constitution and the Declaration of Independence." Forty-seven years have passed. In 2010, a post-colonial world is finding its economic strength and its political voice; the struggle for civil rights has segued to the question of equal rights for gays and lesbians to marry; religious toleration is an issue; nuclear proliferation is still a problem, especially with Iran; Nelson Mandela is retired after serving as the first president of a South Africa free of apartheid; the Berlin Wall has fallen; touch-tone phones share communications technology with iPhones and the internet. Yet, we are still working to make King's dream of brotherhood and sisterhood a reality. The words he spoke in August of 1963 remain our charge, to speed up that day when ALL God's children will be able to sing "Thank God Almighty, we are free at last!"